Tee shirts are ready to go. Place your order here. Price has been arrived at UK£15 and that includes a donation of 50p for the forum (it's use to be decided by members, could be towards the running of the Forum or whatever). Postage price is on top, the price to the uk is £1.99 + £1 per additional item, Europe is £3.99 + £1 per additional item, USA and Australia £4.99 + £1 per additional item. 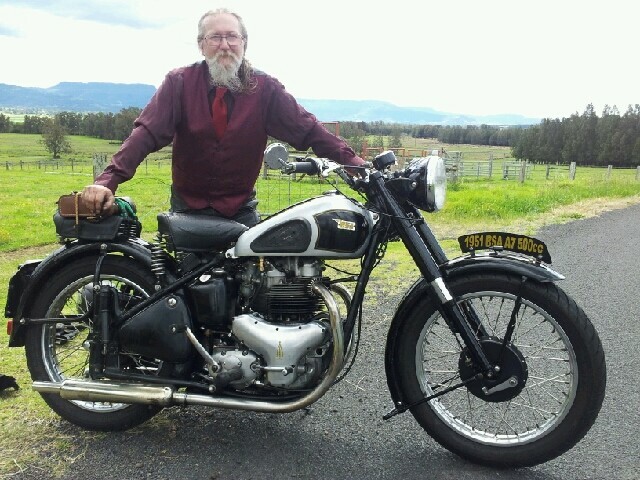 Me 2... flying the flag @ local bike show..
Got mine today. Very good quality, very pleased. Out & about today, at the Kalgoorlie / Boulder Toy Run. Proudly wearing the shirt; me beside some of my bikes. Well done for flying the forum flag! Not the first time you've seen Richard's collection, is it? Besides envying the collection (in a harmless 12,000 miles away fashion), I also envy the difference between the weight of an A10 and the weight of the rider. I also envy the difference between the weight of an A10 and the weight of the rider. I know what you mean, and although I have lost a bit of weight recently I'm still a couple of stone heavier than when I had my original Flash, funny thing is I could throw the thing around when I was 10 and a half stone, I struggle now at 12 and a half, I was 6 ft then as well and now 5'9" how did that happen. Got myself one of each colour for Xmas, very happy. The mention of the All British Rally down under got me thinking this would be a good time to let newbies know about forum t-shirts, also, reminding oldbies (?) at the same time. Too late for the noted rally if you don't have yours yet. Please know that no forum member (and maybe not the manufacturer) profits from the sale of forum t-shirts. A very small part of the sale price is contributed to forum support. I'll be wearing mine during the summer BSAOC camps. If the weather is kind you may even see the tee shirt! Page created in 0.521 seconds with 21 queries.